The next few weeks will be critical. Let’s mobilise against Tory Brexit. It’s happening. Theresa May has negotiated a deal with EU, and it will soon be voted on by MPs. The next few weeks will be critical. To defeat Brexit, we need to keep up and escalate the pressure. That’s why we are calling a weekend of action on the 24-25 of November, alongside Hope Not Hate and a number of other groups. Once again, we will be hitting the streets and doorsteps and having thousands of conversations. We will be doing it on an explicitly left-wing basis, not advocating for the status quo but for the radical change we really need. 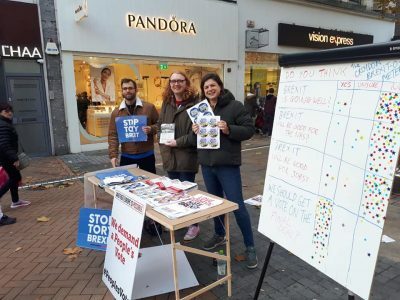 Our first day of action last Saturday was a great success, with campaigning taking place in over 40 locations – ranging from leafleting to door knocking to a 3,000-strong rally in York. We need the next one to be even bigger and better. We want things to be happening everywhere and we need you to be involved. To tell us you’re up for taking part in the day of action, please fill out this form. It will take just a few minutes. If you want more information, or to order materials separately, just drop us an email at info@anothereurope.org.